As a parent of a young child, you’re responsible for making sure that his or her mouth, teeth and gums are as healthy as can be. Thus, you want to know when you should schedule the first dental visit. Additionally, you wonder how you can make these visits less intimidating for your little one. As you read on, your pediatric dentist in Bergenfield weighs in to answer these questions. Once your child starts to eat solid foods and sprout primary teeth, he or she becomes vulnerable to bacteria growth and tooth decay. To protect against either one, you should take him or her in for the first appointment by the age of three, so your dentist can check for any signs of developing cavities and perform a thorough cleaning. For many children, though, a trip to the dentist can be a daunting task. Thankfully, there are some things you can do to help make it a better experience for your child. Take a Fun Tour of the Office – To help break the ice, you can take your child on a tour of the dentist’s office before an official appointment. This will help your kiddo feel more comfortable with the entire process and get acquainted with the staff and dentist. Thus, when it’s time for the real visit, it won’t be a shock. Use Positive Language – Another thing you can do to help the process is to use positive language. Choosing words that are comforting and reassuring will help to boost your child’s confidence and reassure him or her that everything is okay. Restore a Sense of Control – A lot can be discovered about the inner-workings of kids by observing the innate desires of adults. Although they won’t typically burst into tears if things aren’t going their way, adults still desire to feel safe, comfortable and in control. This is a primal instinct that starts in childhood, so that means your little one will want the same. You can accomplish this with your child by never making him or her feel forced to do anything undesirable. Allow them to ease into the process. Instilling the importance of visiting the dentist early in life is one the great gifts you can give to your child. This positive habit will stay with him or her well into adulthood and will contribute to excellent oral health for years to come. To schedule an initial visit, reach out to your children’s dentist in Bergenfield today. Dr. Darren Tong earned his dental degree from the Columbia School of Dental & Oral Surgery. 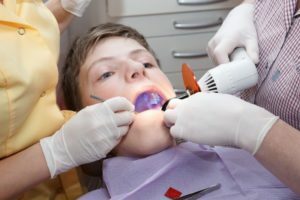 He would then go on to receive his pediatric specialty license, which equipped him with the level of expertise necessary to meet the unique dental needs of children. Dr. Tong helps kids overcome their fears, so they can get the dental treatment they need at Smile More Kidz. He can be reached for more information through his website.